# Put the olive oil into a medium size pot. # When the oil is getting hot, whisk the 2 eggs in a separate cup. # Pour the whisked eggs into the hot oil slowly by stirring. # Add the diced onions, pounded garlic cloves, finely sliced peppers, peeled and diced tomatoes, sugar, salt, crushed red pepper and finally sliced aubergines respectively. # Stir all the ingredients gently, and add 1/3 cup hot water. # Cook over low-medium heat for half an hour. 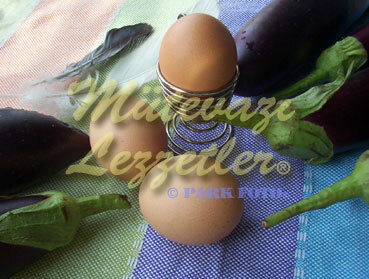 Note: Eggs can be interesting for olive oil dishes, but â€œAubergines with Eggs and Olive Oilâ€� is worth a try.